Announcement time! We will be hosting a Twitter party Thursday September 25th at 9pm EST! 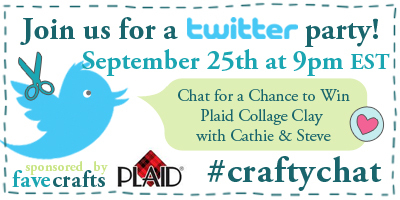 We’d love to see you all there participating in the chat about the exciting Collage Clay from Plaid! Collage Clay is available at Michaels Stores. Cathie & Steve from Plaid will be joining us to answer all of your pressing questions about this amazing clay. 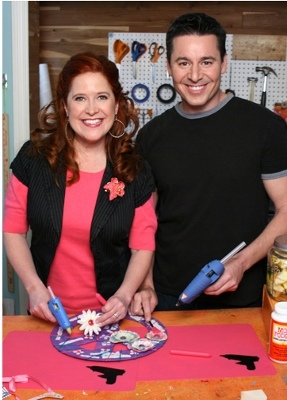 They’ll be offering tips and tricks to make your Decoden projects superb. Plus, don’t miss out on a chance to win prizes! We hope to see you chatting along with us as well! Remember I told you there would be giveaways? Well there will be! All you have to do to win a prize is send out one tweet with the hashtag #craftychat and you are automatically entered! Of course, the more you join in on the conversation, the more chances you have of winning! 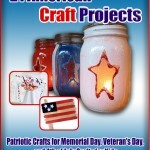 Contest ends September 25th 9pm EST. 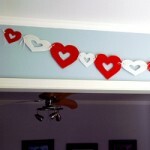 Winners will be announced at the end of the chat. I’m sorry that I had to work and missed the fun!